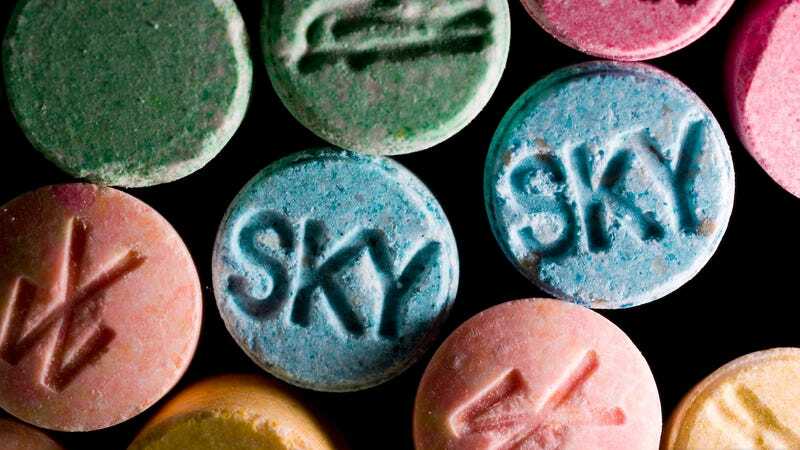 Ecstasy isn’t only for ravers—a small series of clinical trials have demonstrated taking MDMA can be an effective treatment for post-traumatic stress disorder. On Tuesday, the Food and Drug Administration granted permission for large-scale, Phase 3 clinical trials for MDMA, which is the next step in the process to get it approved as a prescription drug. While rolling on Molly might sound like fun and games to you, it changes lives. The New York Times spoke to C. J. Hardin, a veteran who served three tours in Iraq and Afghanistan, who suffered from severe PTSD that left him a divorced, suicidal alcoholic who cut himself off from the world. He tried psychotherapy, group therapy, and almost a dozen different psychiatric medications. “Nothing worked for me, so I put aside the idea that I could get better,” he said. But in 2013, Hardin was lucky enough to join a small clinical trial studying MDMA as a PTSD treatment. “It changed my life. It allowed me to see my trauma without fear or hesitation and finally process things and move forward,” he told The New York Times. This is a huge step for the community fighting to legalize the medical use of drugs like MDMA, LSD and marijuana. The Multidisciplinary Association for Psychedelic Studies, a non-profit founded in 1985 to advocate for the medicinal benefits of these illicit substances, has funded six Phase 2 studies that treated 130 PTSD patients with the drug. It will also sponsor the Phase 3 clinical trials, which will consist of at least 230 patients. A 2012 study conducted in Charleston treated veterans, victims of sexual assault, police officers and firefighters who had struggled with PTSD symptoms for an average of 17 years. None of the patients responded to traditional PTSD treatments. “After three doses of MDMA administered under a psychiatrist’s guidance, the patients reported a 56 percent decrease of severity of symptoms on average,” The New York Times reported. When the study ended, two-thirds of participants didn’t even meet the criteria for having PTSD. “On average, subjects maintained statistically and clinically-significant gains in symptom relief, although two of these subjects did relapse,” the study said. Doctors have legitimate concerns when it comes to using MDMA as a prescription drug—after all, there’s a high risk for abuse, and in an era of rampant prescription opioid addiction, that’s scary. So how does MDMA treat PTSD? Throughout a 12-week PTSD study, patients went through extensive psychotherapy, which involved three 8-hour MDMA sessions. In these sessions, psychiatric nurse Ann Mithoefer and her husband, Dr. Mithoefer, guided each patient through his or her past traumas, playing soothing music. The Mithoefer’s terrier mix Flynn often kept patients company throughout their journey. “The medicine allows them to look at things from a different place and reclassify them. Honestly, we don’t have to do much. Each person has an innate ability to heal. We just create the right conditions,” Ann Mithoefer said. A promising step forward for our nation’s veterans who suffer in silence. When Are You Going to Get Your Prescription MDMA?